Wheelie bins have become a mainstay in British households. Introduced a few decades ago, local councils now provide a range of wheelie bins to help encourage effective recycling. This means that most people have several wheelie bins in use at any given time. While the benefits of recycling are certainly worthwhile, having multiple wheelie bins can be problematic for people short on space – especially as we are encouraged to use more bins. The only logical place to store wheelie bins for most in the garden or at the front of their house, although this can end up rather unsightly. This has led to some rather innovative storage solutions for wheelie bins. Most types of storage are easy to use and inexpensive, while offering some noteworthy advantages! 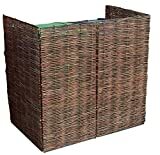 The most obvious reason for buying wheelie bin storage is aesthetics. An increased emphasis on recycling is great, but the fact is wheelie bins aren’t the most attractive sight. Having a place to store them means you can enjoy the benefits of recycling without having to sacrifice any kerb appeal. Better still, your wheelie bins are safely stored in a secure location, meaning they won’t face any damage from severe weather or attract unwanted pests! You can still easily access them when emptying waste. This plastic garden storage shed from Keter is a fantastic option for storing wheelie bins. It can fit up to two 240L capacity wheelie bins or be used to store various tools and equipment. So, if you have one or two wheelie bins this is a fine option. As it’s made from a weather-resistant plastic, the garden shed is certainly going to last, while the wood panel effect offers an attractive aesthetic. The lid and doors are wide opening, making it very easy to transport the bins out when they are due to be emptied. It also offers secure storage, with a foot bolt and door bolt included. The floor is heavy duty so should be fine under heavy weights, and the plastic material will never fade or discolour, so it should look as good as new for years to come! 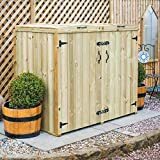 The Rowlinson Wheelie Bin Store is stylish yet robust wheel bin storage shed that is great for anyone with a single bin. Accessing the storage is simple enough, with a lifting lid allowing for easy disposal, while a swing door makes it easy to move for collection day. The bin store is designed to offer ample space, so manouvreing the bin in and out shouldn’t be a problem. Perhaps the biggest selling point of this store is its aesthetics. Simply put, this is a very attractive bin store, with natural woods used to detract attention away from the unsightly bin. This makes it perfect for anyone that hates the sight of a wheelie bin ruining their garden space! Thankfully, the wood comes from a sustainable resource and is treated to avoid any rotting. Expect this attractive bin store to last for many years to come! For a simple yet effective storage solution, look no further than this wheelie bin screening double. Quick and easy to setup while coming with a great price, there is certainly a lot to like with this storage. In fact, you may not even qualify it as a storage space, as it is more of a screen than anything. Made from woven willow, the screen can be easily erected in any space in your garden – or even at the front of your house. The metal frame ensures the screen is robust enough to handle the elements, and it can be either fixed to a wall/fence or left free standing – although be sure to keep an eye during high winds if you don’t secure it! There is no lid to speak of, which makes disposal very easy. All the panels are attached using hinges, so you can also access the bins from any side, so removing the bins is just as easy. It can fit two standard wheelie bins comfortably! There aren’t many more stylish ways to store your wheelie bins than with this attractive wooden storage chest! 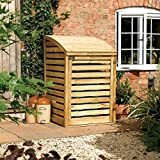 Made from high quality timber, this is the ideal place to store your wheelie bins in the garden, offering ample space and a lovely design that will only enhance your garden aesthetic. In total, the storage chest fits one standard wheelie bin and two recycling boxes. As the wheelie bin lid connects to the lid of the chest, it opens automatically when the chest lid is lifted, offering very quick access when disposing your waste. Latched doors provide access to either side, making it easy to remove the bins and for disposing your recycling materials, with two shelves for storing boxes. All in all, this is an incredibly attractive storage solution. The treated wood is weather-resistance so will last a good time, while you can easily varnish or paint the chest for a more striking design. 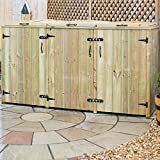 If you have two wheelie bins that you want to keep out of view, then this double wheelie bin storage chest is worth considering. As the name suggests, it can hold two 240L wheelie bins comfortably, with double doors and lids offering easy access. In fact, the lids of your bins can be latched onto the lid of the chest, meaning they automatically open at the same time. When it comes to removing the bins, the latched doors open completely so taking the bins out of the chest is simple enough. Both doors are fitted with bolt locks at the top and bottom, allowing for safe and secure storage. Not only that, but this helps to prevent any unpleasant odours permeating while keeping out unwanted garden pests. Constructed using high-grade timber, this stylish storage chest will hide any trace of your wheelie bins, offering an attractive fixture to your garden space. Many UK households feature three bins for general refuse, recyclables, and garden waste, which certainly takes up a lot of space. 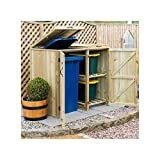 If you’re not a fan of three bins in your garden, then this triple wheelie bin store is the perfect solution. The three latched doors include double bolt action locks for secure storage, while they open wide enough to easily remove each bin when necessary. All the doors come fitted with a handle too, so there should be no issues opening and closing them. As the timber has a natural finish, you can add a coat of paint or stain the wood for any desired finishes.